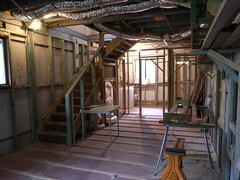 All this rain has meant that the builder has been able to get his team into our downstairs grotto. It's good as it is totally separate from the rest of the house so we can stay warm while they work. The only thing we have had to do was empty it before they came, which considering the amount of crap the previous owner left, was no easy task (hence all our freecycling, http://www.freecycle.org/). 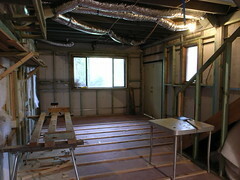 Next week the new windows and doors come and soon the wood floor will arrive. Its already plumbed into the central heating which are the silver pipes you can see in the ceiling. So if you come and stay with us this is probably where you will stay =) with your own bathroom and warm well insulated space. If you click through to the pictures you will see notes attached to tell you about the different bits.